Stayed here In March 2013. (Easter school holidays). We found the hotel to be of a very good standard, our room was fine, a good size and well presented. The usual hotel room, it did however have a fridge which is useful. Its not luxurious, but we don't go away to spend time in the room. Most room have sea views. 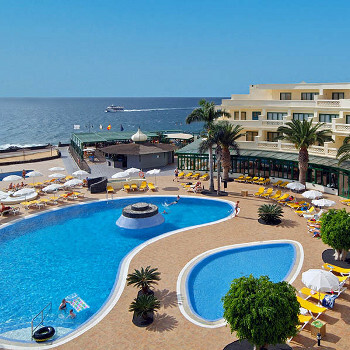 The hotel is split into 3 blocks, "ring" A, B, C.
Ring C being the one closest to the beach and Ring B,(middle) is where the pool bar, largest pool, restaurant, reception etc... are located. Ring A is similar to C.
The location is excellent, as the hotel in right on the promenade, and its a 10-15 mins walk to the ferry port, and town. The rubicon marina is a nice 40 mins stroll (very nice to visit). The beach is close to the hotel (Playa Flamingo), sheltered and safe. There are a few bars/restaurants around the hotel, if you don't want to wander into town. The food was of a high standard, the meats and fish were grilled at 2 stations, so freshly cooked. There was such a huge selection of food to choose from, lunch and breakfast were also very good. We were all inclusive, and we we happy with our choice. Wine, beer are on tap, both in the bar and in the dining room. San Miguel bottled beer in also included in the all inc, its only available from the inside bar (I think)! The staff bring round baileys and brandy at meal time, a nice touch. The staff are wonderful, nothing is too much trouble,everyone has a smile, the staff seem genuinely happy. There is entertainment going on in the day (Boules, rifle shooting, wine tasting, keep fit etc..), but you are not pushed to join in, and most evenings, The evening entertainment is "OK". We really had a lovely break, the hotel doesn't feel crowded as its split into 3 areas, there were plenty of sun beds available so people tended not to "save". There was a good mix of nationalities which is what we like. The only negative is: The pools, they were beautiful, but freezing!! Only the brave ventured into them. There were supposed to be 24o in block B, but they felt as cold as the others in c and A. I was disappointed not to be able to swim. Towards the end of the week, they were slightly warmer and i'm sure as the month goes on l they will be fine, but not in the winter! (the sea was chilly too! ), they really need at least one of the pools heated. Umbrellas also seemed in short supply in block C.
No air con...not a problem for us, but maybe it would be in the hotter months. We thought the hotel was above its 3 star rating and we would return. PS.. If you are a cat lover, you will be pleased to see "cat Houses/cafes" dotted around, where the strays are fed. Please do buy a bag of dry cat food from the spar and leave it as a donation, its greatly appreciated! I booked a week at this hotel as part of a DIY holiday and booked the hotel through Travel Republic. On arrival, I was greeted with a glass of fresh orange juice and then a porter put my bag on his trolley and showed me to my room, so very impressed with that! The room was on the top floor and sea facing too...so the view was very good! The room had seen better days with i.e. some paint work flaking away and rather yellow wall switches but it was nothing in the way of a show stopper! The room was clean and I didn't see any bugs at all! There is no Air Con in the rooms but the bed is right next to the sliding doors so I slept with those doors open but I'd imagine that in July to Sept it could get quite hot as there is not much in the way of circulation. The room was cleaned Saturday to Thursday with no cleaning on Fridays...again this was not an issue for me at all. The low score for hotel cleanliness is due to the sewage smell that would make it's self-known at different times of the day depending on the direction of the wind! The rear of my room was facing north so the wind blast when you opened the door was quite fierce...along with the smell of sewage! It appears to be coming from the rear area of the hotel property and I've read of similar complaints on Trip Advisor. Again, it wasn't a show stopper with me being on my own but I would imagine that families would not be too happy about such a whiff coming and going. I opted for the Breakfast option and the food was ok and plentiful! It was all in a buffet style with fruits, cold meats, breads along with two chefs cooking up stuff like fried and scrambled eggs, bacon (the streaky fatty style) and German style sausages. The distance from the main area of Playa Blanca was a five minute stroll (no need for a taxi?) and all one straight line. There is a great pub about 2 minutes’ walk away called the Irish Anvil and they do some good lunches! Nice resort and great weather! This was a lovely hotel just out of Playa Blanca you would need to get a taxi to get to the resort. Food wonderfull and staff very friendly. 5 pools in total lovely and clean I would recommend this hotel to anyone. Entertainment excellent they kept the children amused all holiday well done to the staff at Lanzarote Park. The hotel was nice enough, nice location, reasonably clean rooms if a little outdated fixture and fittings wise. The food was incredibly bland, and the restaurant was like a school canteen which had no air conditioning so seemed to be a very hot 40 degrees all the time. We were half board, and could not swap dinner for lunch at all. Consequently we went out for Breakfast, Lunch and dinner most of the time we were there. The entertainment at the hotel was just a joke. A group of the same people every night just miming along to songs, and doing poor quality dancing. It certainly did nothing for me. Don't think I will be going back again, I'm sure there are better places there than this. The Brochure stated that the Hotel had been refurbished in 2005. Not quite true some new furniture in rooms but fixtures and fittings not new. Various works ongoing, pools closed, new lifts being installed, public areas being painted. The food was very monotonous. Another unsettling thing was the waiters/waitresses pouncing to remove your plates the moment you had finished. On reflection we won't be going back. Hotel rooms were always kept clean and tidy. Pool was ok but with it been right on the beach front when they were a few windy days the pool got full of leaves. Hotel staff very friendly and helpful. Only think was we had a ground floor overlooking the pool and at night we were invited by millions and millions of ants. So I would recommend that if you stay at this hotel please choose a higher floor rooms. Overall a nice holiday with a nice clean hotel. The staff were very helpful and the evening entertainment was brilliant and very funny. away and the lads there are great.